Osawatomie is a Kirkbride style institution built in 1868 and 1881. 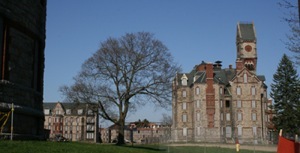 The original Kirkbride building was torn down in 2002 though a cornerstone and reflecting pool were left as a memorial to the buildings history. The hospital is still operational.